One of the not-so-great aspects of carving away from home is the portability of one’s tools. I have an old suitcase to throw my rolls of gouges and knives in which works okay. I also built a wood case for my power carver / wood burner with compartments to hold the accessories. The problem with burrs for rotary tools is their variety of size and shape. The readily available cases are simply holes drilled into something with some sort of lid. This works if the case stays stationary; as soon as the storage tips sideways all the burrs fall out of their holes. It’s a mess. After a few unsuccessful attempts and making a custom case I came up with the idea of using magnets. I purchased one of those magnetic tool holding strips that magnetizes to the side of a tool chest – and magnetically holds wrenches and screwdrivers. I cracked open the cosmetic plastic body and found six strongly magnetized strips inside. 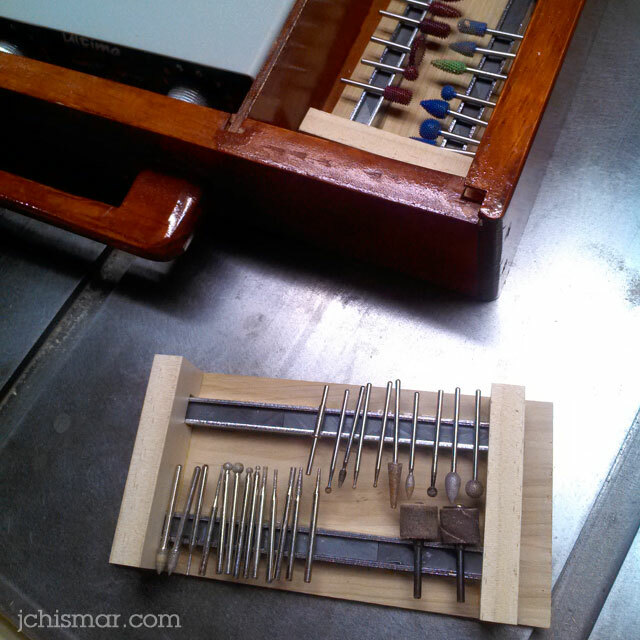 I mounted four of these magnet strips to some plywood cut to fit into the compartment of my power carving case. This works great! My only regret is making the bit compartment of my case so small; it would be nice to have a little more real estate to spread the burrs out away from each other.